Here are important entrepreneurial lessons we can learn from the these two popular boxers' career strategies. Floyd Mayweather Jr. and Manny Pacquiao have finally faced each other in the boxing ring after long years of waiting. This is the biggest boxing match for the past two decades and both have created incredibly successful personal brands. But that success has been achieved using two very different strategies. Considering both Pacquiao and Mayweather as potential road maps to entrepreneurial achievement, here's how the two fighters have reached the top--in their own ways. Related: Your brand is your promise. Don't make it lightly. 1. Put in the work. It isn't easy in any industry to do something for almost 20 years and never fail. But there's Mayweather, with his 48-0 record. This is, in large part, because he's known as one of the hardest-working boxers in the sport. There have been countless stories in boxing history where a champ slacked off in preparation for a subpar opponent only to be embarrassed in the ring. Mayweather's never put himself in that situation. He's tireless in his training and truly obsessed with his craft. That kind of dedication will end in massive success--no matter the line of work. 2. Be selective. Mayweather has something of a reputation for taking on less-challenging opponents. On the one hand, that tactic's easy to criticize since it may appear as though he's avoiding the toughest boxers. On the other hand, he's established a brand as the best boxer alive because he's never lost. Choosing more reasonable opponents is akin to being selective about where and how a business sets up shop in a new market. As a marketing strategy, it can work to dominate a small market rather than flounder in a huge one--though Mayweather's had success with both those strategies. 3. Build your brand. Ever since Mayweather served as the focus of HBO's 24/7 reality boxing TV series in 2007, he's done everything possible to lift himself up as the premier talent in his craft. This means appearing on TV shows, owning social media and doing countless interviews to keep his name relevant even when he's not training for a specific fight. 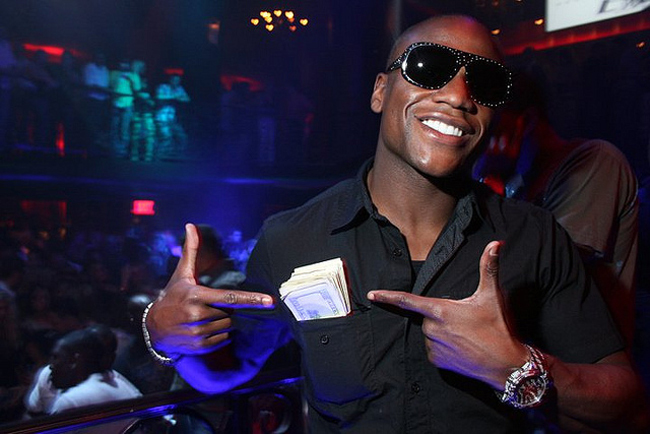 These are the types of things a burgeoning entrepreneur needs to do to develop his or her brand, and Mayweather, who's earned himself memorable nicknames such as Pretty Boy Floyd and Money Mayweather, has made the most of his brand-building opportunities. 1. Be authentic. 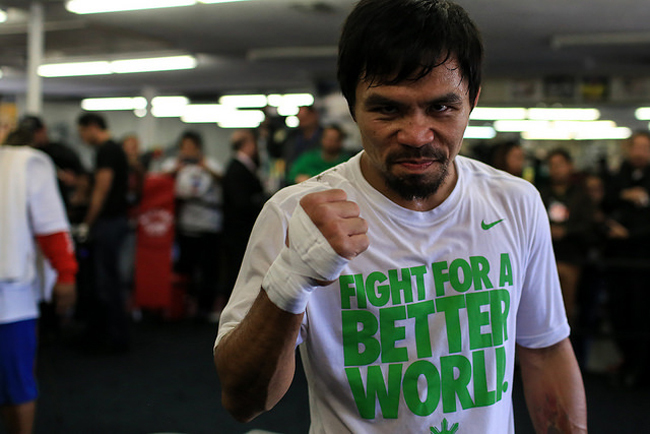 One of the things people love about Pacquiao is that he seems genuinely likeable. He's appeared in several movies and even recorded albums for release in the country, proving that the public loves him enough to consume his brand even away from boxing. A lot of that has to do with his authenticity. He almost always seems to be smiling when away from the ring, and combining massive achievement and talent with that sort of likeable persona can be a key in drawing fans to a brand. 2. Take on the best. Where Mayweather often avoids boxing against the top talent in the industry, Pacquiao embraces the tougher fighters. A 2003 fight against Juan Manuel Marquez ended in a draw, for example, so Pacquiao insisted upon a rematch within five years. Of course he won the second time around. He's beaten bigger boxers--Oscar De la Hoya and Ricky Hatton--and he's not shying away from a matchup with Mayweather himself. On the one hand, there's value in dominating a small market, but when a brand is ready to take on the world, go get 'em. 3. Go global. Boxing is one of the few internationally popular sports, so while he's loved in the Philippines, his home country, fans worldwide love him, too. And that's by design, since there are obviously more consumers in the world than there are in the Philippines or the U.S. alone. It's simply a matter of numbers--the more people a brand can reach, the more potential there is for growth. Pacquiao has figured that out, to his massive benefit. While becoming the greatest in any field can prove challenging, the examples set by these two vastly different boxing superstars can be applied to a number of modern businesses. Entrepreneurs are entrepreneurs, regardless of their field, and these two men have figured out how to play the game.